Perry, Okla., October 3, 2017 – While new technologies have continuously improved utility locating and HDD guidance, the tracking process on HDD bores has remained relatively unchanged since the introduction of horizontal directional drilling. Subsite® Electronics, a Charles Machine Works Company and leader in HDD Guidance System solutions, announced today plans to change that. New technologies from the company have made possible an HDD process they are calling Green Ops that will reduce risk and improve efficiency and profitability on HDD bores. 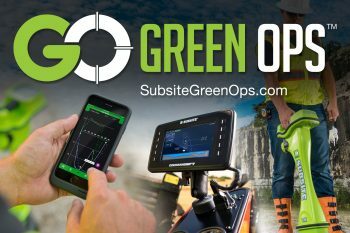 The Green Ops process combines a more thorough investigation of the underground job site with a shift in “command” of the bore itself, immediate in-field reporting upon completion of the bore, and online access to jobsite data long after the project is done. The process starts with a pre-bore analysis of the jobsite. This planning and mapping before drilling begins is essential to achieving increased safety throughout the duration of the project. Traditionally done with pad and paper, Subsite’s Field Scout™ Mobile Bore Planning App utilizes your iPhone® or Android™ smartphone to collect this information and give you the connectivity to upload it directly to a guidance display on the drill itself. With accurate utility locating completed, users can mark critical waypoints such as the entry pit, exit pit and crossing utilities along the bore path in the Field Scout planning app. Users can also record depth, indicate where potholing needs to occur, and forward accurate location information to the drill operator by utilizing the GPS compatibility of the Field Scout app. By collecting this data electronically, it enables users to send the information to a supervisor or owner for plan approval, to the crew to initiate daylighting, and to the drill operator so he’ll know when critical crossing are coming up. Electronic mapping and planning minimizes risk, enables potholing ahead of time, and helps crews be more informed and thus, more productive and efficient. Perhaps the biggest shift in thinking the Green Ops process advances is the “transfer of power” to the drill operator. On today’s HDD job site, the tracker operator commands the bore. He is trained and skilled, and he has access to all the vital tracking information needed to safely guide the bore. With Green Ops, that data is also delivered directly to the drill operator. As a result, customers have the option of putting the drill operator in command to maintain the intended bore path in real time, making adjustments as needed. This more direct communications with the hand that guides the bit is more efficient, but it also limits the learning curve of new crew members by leveraging Advanced Drill-To™ technology. To facilitate this real-time monitoring from the drill seat, Subsite developed the Commander™ 7 HDD Guidance Display and ScoutView™ Commander™ 7 Software. ScoutView allows you to upload your plan from the Field Scout app so you can monitor your bore in real time, align your live bore with your plan, log bore data, and display bore info when approaching a waypoint/obstacle—all from the drill seat. Once drilling is complete, the third part of the Green Ops process begins: reporting. Advanced software solutions let you download HDD bore information directly to your mobile phone, tablet or computer, speeding production and reducing logging errors. Then you can generate and send an As-Built report as soon as the pilot bore is completed, right from the field. Visit www.subsitegreenops.com to learn more about the Green Ops process. For more information on Underground Awareness products from Subsite® Electronics, visit www.subsite.com or any of our social media channels – Facebook, Flickr, Twitter, Google+, LinkedIn and YouTube. You can contact us at info@subsite.com or 800-846-2713.